Blogger Buster: The Entrecard Ebook, Multiple Blogs and Get 2000ec for Free! The Entrecard Ebook, Multiple Blogs and Get 2000ec for Free! I've always been partial to a freebie, so when I heard about Entrecard and the possibility of earning free advertising by using the Entrecard widget, I couldn't wait to see how this would work out. A few months down the line, Entrecard has certainly proved itself as one of the most useful free services available to Bloggers. I wondered how Entrecard could make this free service even better, until today an email from the Entrecard team landed in my inbox which brought a great big smile to my face. To vastly improve the current service, the Entrecard team have today enabled multiple blogs to be administered from one account, or merge two existing accounts together. This means you can now add more blogs to your account, or merge two different accounts together in order to manage your blogs in one place. You can easily transfer entrecard credits between accounts when merging them, or switch "identity" when dropping cards to allow both of your blogs to receive equal exposure (or not, if you prefer!). What's more, if you add more than one blog to your Entrecard account before 25th of June, you will be entered into a prize draw where you could win 15,000 Entrecard credits. 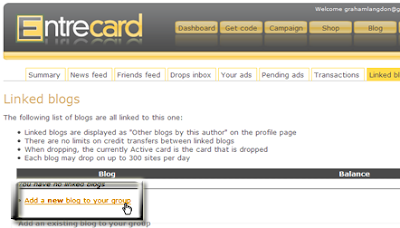 If you haven;t already tried Entrecard as a means of blog promotion, there has never been a better time to sign up. Entrecard have released a free eBook which explains everything you need to know, from discovering how to drop cards and advertise on other blogs to strategic ad placement and "dropping like a pro". Even experienced Entrecarders could learn lots more about the service by reading this free download. I've only skimmed the surface so far, but from what I've read already I would strongly recommend this to anyone even remotely interested in using Entrecard or seeking means of free blog promotion. Download your free Entrecard eBook and let us know what you think about this. Yes, you did read the title right! In order to help spread the word about the Entrecard service, the team are offering 2000 Entrecard credits to anyone who writes about the new developments and eBook in their own blog.